you can trust & rely upon! We provide fast 24-hour emergency service for all your plumbing repair, Sewer and Drain Cleaning needs! We cover most of Connecticut! Schedule a service any time 24 / 7! 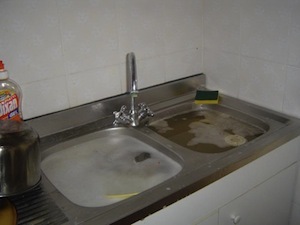 When you have a Clogged Sink Drain in your Connecticut home or, business give Clog Dr. a call. The Clog Dr. has been serving the sink drain cleaning needs of his Connecticut customers for over 10 years now, and he brings prompt, reliable and affordable service, with a written guarantee to all of his commercial & residential customers. Our vast knowledge assures that your clogged sink drain will be running clear again. The Clog Dr.’s extensive experience in clogged sink drain cleaning ensures that they will rapidly recognize what needs to be done to clean your clogged sink drain, we’ve seen them all. We’ve been taking care of our customers’ clogged sink drain with proven success. Let us make your clogged sink drain running again! And More! If It Drains We’ll Unclog It! Clog Doctor, the most trusted company in Plumbing Repair, Camera Inspection, Sewer and Drain Cleaning needs since 2003! Fantastic! Clog Doctor was not only capable and experienced plummer but was also polite, respectful, very careful, pays attention to detail and is willing to help with a few of those extra annoying odds and ends that you never seem to get around to fixing. 5 STARS... and I wish I could give 6!